Choi sum ( 菜心) means vegetable heart in Cantonese. I started this in the morning before I went to work, almost done and left feeling happy about it. 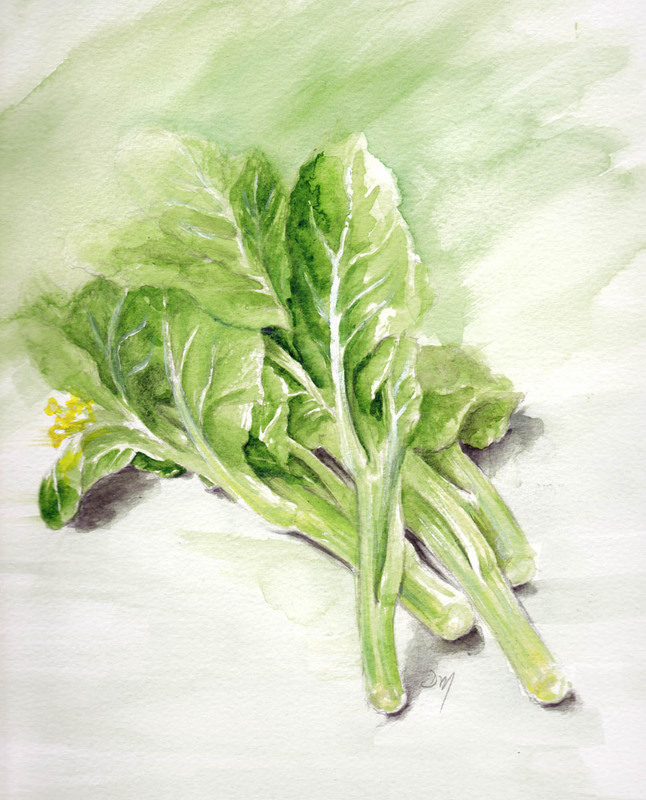 So now , I know better than to start a painting, go to work, and leave my choi sum (菜心) out in temperatures of around 30 degrees...come home at 7pm and try to finish it............not only does the light change but it wilts, moves and nine hours later you've lost the veggie vibe. I suppose it's a good lesson and a step towards a looser way of painting. It's also made me realise how little good working light we have in our place, but made me appreciate the natural daylight we have. Thanks for your comments so far everyone, have a lovely weekend. Gorgeous! You have made such skillful use of the white paper. It looks so pretty even if you think it looks unfinished. It looks fresh and lively and rather yummy. I'd like to have a veggie that looks so fresh to put in my wok! I can't buy anything that looks like this! Even though you couldn't finish it - it's very pretty! Wow, beautiful! I love this and the beetroot. It seems to me that you did an excellent job as always, it looks really fresh. Gosh. All this before work? What a great start to the day - you put me to shame. Nice highlights on the leaves with lovely sturdy veins.